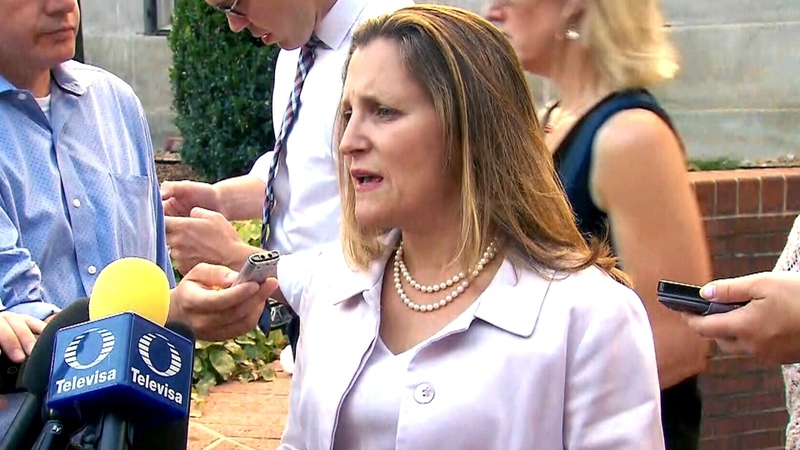 OTTAWA -- Canadian and U.S. officials say the path to a renegotiated North American Free Trade Agreement is opening up, and could come together this week. Dispute settlement: NAFTA contains three mechanisms for settling disputes. One of them, known as Chapter 11, is designed to create predictable investment conditions by allowing companies to sue governments for unfair treatment. Chapter 19, the second mechanism, enables industries to fight punitive antidumping and countervailing duties. The third, Chapter 20, lets countries sue other countries. In the original NAFTA negotiations, Chapter 19's inclusion was a key condition for Canada. It has been used over the years in battles against softwood lumber duties. Fast forward to the NAFTA 2.0 talks and Chapter 19 is still make-or-break for Canada. The Trudeau government has repeatedly stated it won't budge on its position that Chapter 19 remain in a renegotiated NAFTA. The U.S., on the other hand, wants to eliminate Chapter 19. Dairy: Canada's protected dairy industry, a longtime bull's-eye of U.S. President Donald Trump's angry tweets, has emerged as a major late-stage irritant. Dairy is a politically charged issue in Canada and was widely expected to be among the final NAFTA stumbling blocks. In Canada, it's a near-$20-billion industry that employs more than 220,000 people. The sector's supply-management system is considered sacred in Quebec and Ontario, which have the biggest provincial populations and, thus, wield the most political influence. The Trump administration, however, has demanded that Canada get rid of its tariffs on dairy, as well as poultry and egg products, to open up opportunities for American farmers. Ottawa seems prepared to consider concessions to Washington on Canada's dairy market, while also trying to preserve the supply-management system. Pharmaceuticals: U.S. trade policy states that other countries should contribute more to the hefty costs of research and development by paying more for pharmaceuticals. In particular, the U.S. wants Canada to be more transparent in how it determines drug prices and changes to how they are set. It also wants longer patent-style protections on biologic treatments. Under its new deal with Mexico -- which Trump has urged Canada to sign -- the U.S. says there's an agreement on provisions that include 10 years of data protection for biologic drugs and an expanded list of products that are eligible for protection. Exemptions on cultural products: U.S. lawmakers have called on Canada to weaken its protections for cultural industries that are exempted from the current NAFTA. U.S. Trade Representative Robert Lighthizer has argued there's a legitimate case for some cultural exceptions, but that "the cultural exemption is very often just cultural protectionism." Prime Minister Justin Trudeau has connected the issue to bilingualism -- as an important tool to protect culture, languages, creative sectors and artists. Quebec has insisted it's crucial to maintain protections in this area in order for it to maintain its francophone culture. Sunset clause: The U.S. initially proposed that a new NAFTA include a so-called sunset clause to ensure the deal is renegotiation every five years. Canada has publicly rejected the idea, saying a sunset clause would leave too much uncertainty for potential investors. This week, however, the U.S. and Mexico agreed on a watered-down version. Their new bilateral deal would expire after 16 years with reviews every six years. It's unclear whether Canada would accept the new proposal.